(Bloomberg) -- French President Emmanuel Macron is on the offensive, seeking to regain his footing after being mocked by Italy’s leaders, largely ignored by Germany’s rising political generation and threatened by Yellow Vest protesters. 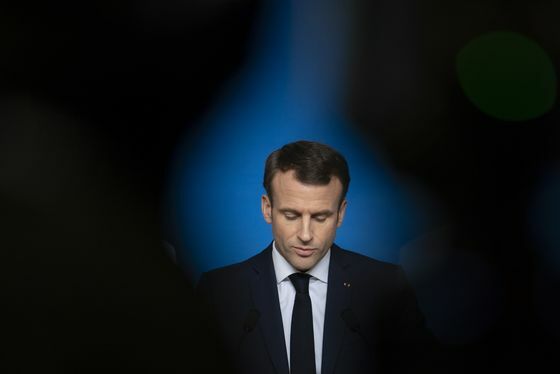 Three months before a European election, the burst of assertiveness signals Macron is stepping up his campaign to boost his standing after months of scandals and domestic trouble. In the process, he also wants to deny nationalist parties a triumph at the polls. The activism has landed Macron, 41, in the worst diplomatic dispute with Italy since World War II. He also miffed leaders in Berlin by seeking limits on Nord Stream 2, the natural-gas pipeline from Russia supported by Chancellor Angela Merkel, though France and Germany found a compromise in the end. “The reason Macron finds himself in a tense situation on a series of issues is that the European elections are approaching,” said Manuel Lafont Rapnouil, head of the Paris office of the European Council on Foreign Relations. Relations with Italy cratered on Thursday when France recalled its ambassador to Rome, citing meddling in domestic affairs after Deputy Premier Luigi Di Maio met with senior figures of the Yellow Vests movement in France. The same day, France ignored German wishes by insisting on EU oversight of Nord Stream 2. “With the Italians we needed to hit hard, with Germany we needed to make things clear,” a French government adviser said. Macron took the presidency in 2017 promising to remake the EU as a global geopolitical power. Then, Italy’s election in March swept out an allied government in Rome. Merkel, undermined by the rise of a German anti-immigration party, said in October she won’t seek another term as chancellor and subsequently quit as head of her party. Merkel’s successors are less inclined to accommodate France on further integration of the euro zone. The two governments also differ on the response by populism: France’s call to take a proactive approach doesn’t resonate in Germany, the official said. Germany was taken aback by France’s insistence that Nord Stream 2 be subject to EU oversight, but French officials say the government in Berlin was aware of their position. The 1,200-kilometer (746-mile) undersea pipeline has sparked a geopolitical battle within the EU and across the Atlantic, with Eastern European countries wary of Russia and the U.S. opposed. Hours after France took a public stand on Nord Stream -- “a card we played,” an official in Macron office said, to accelerate negotiations in Brussels -- Merkel pushed back against reports of a breakdown in relations. She said they had reached compromise as the result of the two countries’ cooperation. “You should know how often I meet with President Macron, how often we speak – we cooperate on a daily basis across all European dossiers,” she told reporters in Berlin on Friday. Still, the new leaders of Merkel’s Christian Democratic Union have grown wary of Macron and his plans for the euro, especially after he announced 10 billion euros ($11.3 billion) of tax cuts and extra spending in December to placate the Yellow Vests protesters. That spending will push France’s deficit next year through limits set by the EU, a sensitive subject in Germany. The CDU also refused to join Macron in forming a pro-European coalition for European Parliament elections in May, instead preferring to remain in the People’s Party caucus. And while Merkel will address a global security conference in Munich next week, Macron withdrew to focus on the home front. Macron’s response to the Yellow Vests -- opening a national debate on taxes and democracy -- has helped lift his approval rating. Now, the word from Paris is that he’s had enough of the insults and perceived provocations by Di Maio and Matteo Salvini, Italy’s other deputy prime minister. “It’s about saying that school recess is over,” France’s EU Affairs Minister Nathalie Loiseau said Friday on Radio Classique.